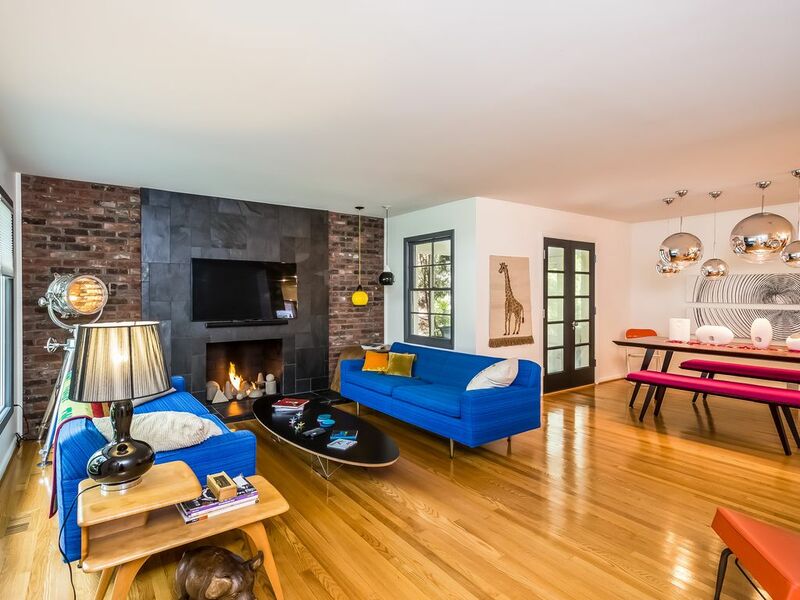 Authentic mid century brick ranch, luxuriously furnished and landscaped home available for short-term rentals. Step into this fully renovated, colorful 1949 gem with restored white oak hardwood floors throughout. Interior masonry and slate gas fireplace is set beside picture windows with a street view and ample natural light. The open floor plan welcomes you through the dining room complete with contemporary fixtures and access to the screened in, seasonal porch. Perfectly situated next to the sleek, modern cherry kitchen with stand alone ice machine, dishwasher, new vintage inspired refrigerator, stainless steel double oven and gas cooktop. Live smart in the black and white master bedroom with corner windows, solid walnut bed and queen size mattress, black out top-down-bottom-up shades, custom closet and full mirrored pocket doors. Second bedroom overlooks the ultra private, tranquil, fenced backyard through corner windows with top-down-bottom-up thermal shades. Japanese soaking tub, rain shower, heated bathroom floors, teak double sink vanity, and mossy green penny tile create the perfect oasis to forget busy metro Detroit. Retro painted 1 car garage features a heater for winter months with easy access to the basement refrigerator, laundry and utility room. Owner occupies contained, out-of-the-way basement storage. Utilities include gas, water, electric and internet. Snow removal and lawn service included. Location ideal for coffee, smart dining, groceries, delivery services and all of the perks of living in the Pointes. Immaculate condition, absolutely no pets of any kind allowed, no smoking, short term rentals only, minimum of 5 nights. $100 non-refundable cleaning fee. Beautiful, Fun & Happy Home! I thoroughly enjoyed my stay at this cheerful and whimsically decorated home. It was very clean and well equipped. I felt right at home. Wren was very welcoming in her emails. I look forward to future stays at this beautiful, fun and happy home! Great stay. It's a nice and convenient home that is well-curated. Would stay again and recommend. Thank you. This is our 3rd stay at Wren's Nest & it's been perfect every time! This home is so clean, comfortable, quiet, with so many beautiful details. The kitchen has everything you might need, the bathroom is spotless, the bedrooms are quiet & very comfortable to sleep. So many thoughtful details that make a guest's stay wonderful. The host responds very quickly to any questions, very easy check-in & out. The location is perfect! Easy drive to Downtown/Midtown Detroit, easy commute to Detroit Metro Airport. Short walk to restaurants, shops, Starbucks, grocery. We will return anytime we are in Detroit! Wonderful home hear everything in Grosse Point and East Detroit. Would highly recommend. Amazing, immaculate, comfortable, quiet, great location, every amenity! !